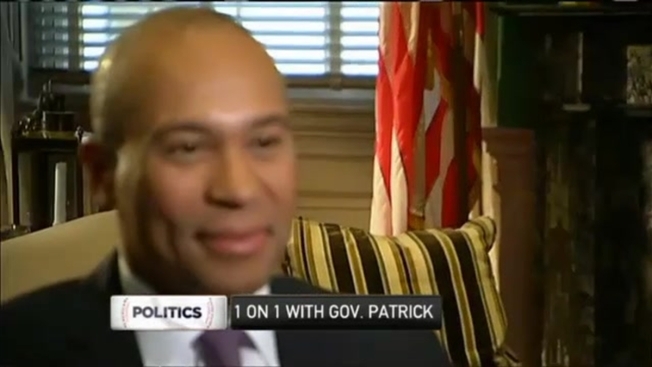 Massachusetts Governor Deval Patrick sat down with NECN's Alison King on Tuesday to reflect on the eight years he spent in office. Gov. Patrick considers one of his greatest achievements to be the state's economy, which he described as "thriving." "It's growing twice as fast as the national growth rate, we have a 25 year high unemployment, we lead the nation in student achievement and health care coverage and veterans services and energy efficiency," Patrick explained. This past year, Gov. Patrick was criticized over problems involving the state's Department of Children and Families and the Mass. Health Connector; however, he will be remembered for how he handled the 2008 market crash, the Boston Marathon bombing, and his work with the life sciences. "I wish we had made more progress getting pressure off the property tax. I still believe that the property tax is overrated," Gov. Patrick said, when asked about what he wish he had the opportunity to address. In addition, Patrick said he wishes he had been able to do more work with sentencing reform, including an end to mandatory minimum sentences. Gov. Patrick says he will miss moments with Massachusetts citizens that he has been able to help. When asked about his future plans, Patrick has been consistent with his answer to pursue a future in the private sector. Gov. Patrick also addressed if he is interested in running for president in the future. "I hadn't been thinking about running for president. I've had an astonishing and humbling range of people from all sort of stations from all parts of the country asking me to think seriously about it. If I think seriously about it I know it has to a family decision and I think as a family, we couldn't possibly get ready for 2016."